Cricket legend Sachin Tendulkar has weighed in on a viral video concerning Tennis icon Roger Federer from the Australian Open, demonstrating, in a nutshell, both players' modesty. The video in question has been shot in Melbourne, where on Sunday Roger Federer was knocked out in the Round-of-16 by Stefanos Tsitsipas - a 20-year-old Greek wonderkid - who the Swiss ace's 2-year reign as Australian Open champion and prevented him from winning a 7th career Aussie Open. 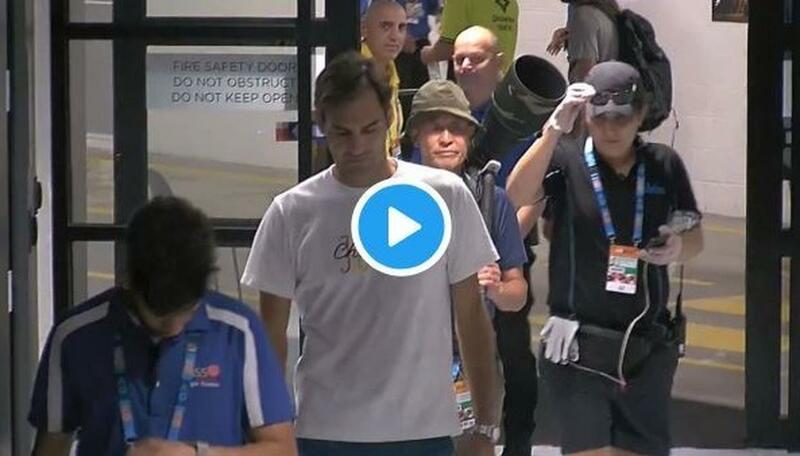 In the post-loss video, Federer can be seen walking down the corridor at the Rod Laver arena towards the locker room. In sharp contrast to everyone else who is carrying something or the other (coffee, cameras, etc.) Federer is empty-handed, simply wearing a shirt that reads 'Chillin'. As he makes to enter the room, a security personnel (in a yellow shirt) politely stops him and signals at his own identification card - telling Federer that he should be wearing one as well. Federer, the winner of 20 career grand slam titles - the most in men's tennis history - who is known worldwide and most certainly so at the Australian Open, did not react adversely to being stopped in such a way. He waited patiently, peeking down the corridor to watch a member of his staff walk down the same corridor. The man then showed the security officer his own accreditation, and then the pair were allowed to walk in. The Australian Open's Twitter handle posted the video, remarking at how even the great Roger Federer needs his accreditation. Sachin Tendulkar, a known Tennis fan, also posted his thoughts about it. Sachin commended both the officer as well as Federer, citing how such reactions weren't commonplace anymore in the world of celebrity sportspersons' fits.